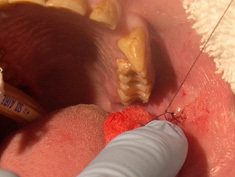 Inflating tube cuff to establish secure airway, an essential step for all intra-oral and dental procedures. 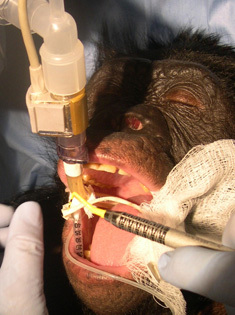 View of soft tissue swelling under buccal mucosa near Wharton’s duct which provides saliva from the Parotid Salivary Gland during mastication. 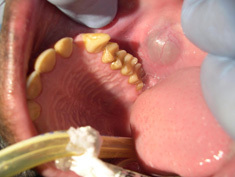 The most common pathologic condition of Wharton’s Duct is sialolithiasis, which is an obstruction of the duct causing retro-obstructive sialodentitis. 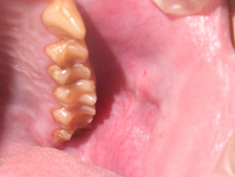 This condition is also seen with squamous cell carcinoma involving this region of the mouth. Closer view of fluid filled swelling. Removal of fibroplasia encased foreign body of plant material. 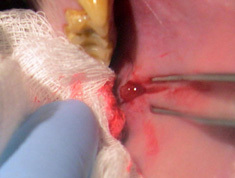 View of mucosa immediately after removal of foreign body and fluid. Closing incision with #4-0 resorbable suture material.